What is The Morrow Project? 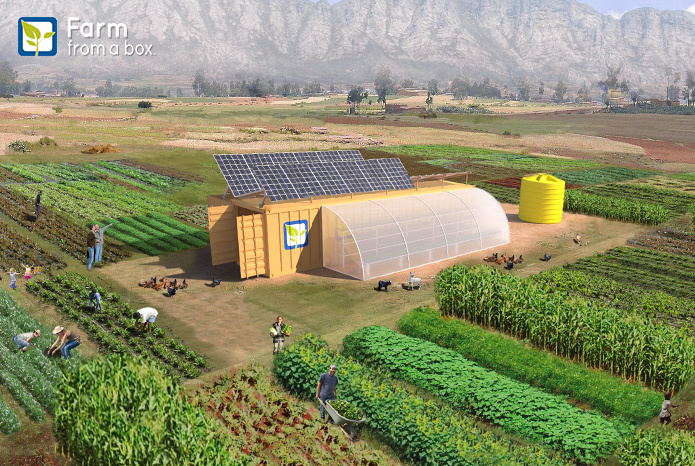 This is a “real-world” idea: a 20-foot container that contains everything necessary to set up a 2-acre farm. With the addition of a few animals (3 or 4 goats, a couple of pigs and 10 chickens) it could feed 10 people a year. .
Farm from a Box includes WiFi, irrigation system, solar panels, weather tracking devices, batteries and more. It also contains seedlings, farming equipment and a training program to provide communities with the tools the need to feed themselves. It’s also equipped with high-efficiency LED lighting, secured storage, a mobile charging area, Wi-Fi and a remote monitoring solution. Also, seeds and farming tools . The farm also comes with a training program that covers ecological farming practices, technology use, maintenance and basic business and entrepreneurship. Your RECON team has defeated some local enemies and now wants to help the local people. What are they going to do? They have limited gold and equipment but they have skills and knowledge . How do they apply these? What do they buy or build? The following is a list that might inspire some ideas for the team’s specialists. Suri was always an ambitious woman. She chose her career because it gives her status, daily challenges – and the chance to prove that women can do the job. She is also very fond of speeding around on her (homemade) buggy. Suri has a minor mutation: “extra” teeth in her upper jaw. This has given her a lisp and makes her slightly self-conscious about smiling and laughing. At some point, she had dental surgery to remove several teeth (she still has an extra set of canines). She’s very professional and will deliver mail to anyone, anywhere. She is very supportive of EmDees, midwives and other medical types. The nickname “Quick” is only partially due to the speed of her buggy. Suri chose it because it’s easier for her to say clearly. It is her radio callsign. The dental surgery was performed by a group associated with the Breeders. In partial payment, she agreed to have a Tubal Ligation operation. The Lunar Convent is one of the major powers in Traverse City. The nuns have a strong economic powerbase (the Convent owns extensive amounts of property). They also have extensive political influence because they run schools and provide spiritual/financial/medical help to the poor and the outcast. The Nuns regard themselves as Roman Catholic and try to follow the teachings of the Church as best they can. However, their rules of celibacy are a little “different”. Nuns wishing to become mothers can be (temporarily) released from their vows and can rejoin the convent once their youngest child reaches the age of 13. The convent is a sanctuary for abused women (ranging from “battered wives” to prostitutes and escaped slaves). There are numerous jokes about visitors who mistake the convent for a brothel. Sailors (including some Lakers/Shipmen) and fishermen make offerings to Our Lady of the Lakes. The Lunar Convent is a sanctuary for Witches/Warlocks. A few of the Nuns are psionic. They deliberately select candidates who have psionic ability and encourage these women to have children. The main Inquisitor church has a grudging respect for the Lunar Convent but is unsure of how to deal with these nuns. There will undoubtedly be a problem in the future but – for the moment – the Church hierarchy is unwilling to confront the situation. They want to avoid any risk of schism within the Church. Small “pocket-sized” grenades… that can be launched from a revolver. Because sometimes it’s not just the good guys who get the weird stuff. 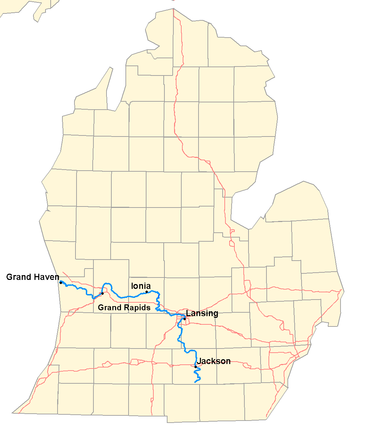 The lower Michigan peninsula (like many areas) has a problem with Slavers. However, they do not identify themselves as “slavers” and will claim to be Agents of the Michigan Emergency Prisoner Workfare System, or MEPWS. The MEPWS dates back to the beginning of Maxwell’s Militia. When the Militia seized power, it had to make decisions about the fate of prisoners held in Michigan’s jails. Many (mostly old, sick and non-white) were killed, but some inmates were incorporated into a “Prisoner Workfare” system where they were given the choice of working or starving. The system was always corrupt (especially with the female prisoners) but – in general – the prisoners were a useful asset. They were used on farms, road repair and in the more dangerous salvage operations. Also, the Militia found that some prisoners had useful skills such as mechanics and welders. The MEPWS was so useful to the Militia that it “became necessary” to keep prisoners for life. Propaganda stated that the Prisoners were incapable of life “outside” and needed to be kept under supervision. In other words, there would be no chance of parole, or even release. Children born to female prisoners were given the status of “inmate by birth”. The MEPWS operated for decades and partially survived the collapse of Maxwell’s Militia. It now operates out of pre-war Prison facilities in Ionia and Jackson. Naturally, it is on very good terms with the Steel Crusaders. The Steel Crusaders, are a large, heavily-armed group of Bikers, the primary “military” force of Southern Michigan. They might be encountered anywhere in Michigan, but are most likely to be found near the Grand River. The SC roam – at will – along the river valley; they prey upon the communities that exist between the ruins of Jackson and the ruins of Grand Haven. The majority of the Crusaders are in their late teens or early 20’s. Most of them are simply swaggering thugs – lording it over people who are too frightened or too weak to fight back. Background note: In this campaign, Traverse City (aka “TC, or “The City”) provides an opportunity for a different “style” of play. Players can involve themselves in the intrigue between the City’s political/economic/military powers. The City is a trading hub for Lake Michigan. Everyone comes to TC. Everyone buys and sells. Shipmen (of course), Truckers, Slavers, Wanderers and many others sell their goods and services. Wines and fruits are the main agricultural exports, but the city also has a strong manufacturing sector. At first glance, Maxwell’s Militia has the greatest amount of power. The Overlord’s son is “Sheriff” and his M1 tanks have the most visible power. The MM could close the port, or stop food coming into the city at any time. However, that would remove all value from the city. Task Group Michigan is assigned the following. An additional cargo trailer is set up as a portable laboratory. No specific Science Team is assigned to Task Group Michigan. However, the Command Team has the capability to communicate with a Science -One unit operating in Wisconsin. OIL TEAM: As implied in the “Commander’s Intent” briefing, one Specialty Team is capable of operating an oil well. It consists of 10 personnel (geologists, and mechanics/technicians). It has 4 trucks which carry the necessary equipment to extract and refine fuel, lubricants and various other petrochemicals. AIR TEAM: Two Airscouts are assigned to Task Group Michigan, along with 8 personnel to fly and maintain them. PORT INFRASTRUCTURE TEAM: This is a large (20-person) team of civil engineers and technicians. Their role is to clear, maintain and operate river and lakeshore ports. They have the same equipment as the Engineering Team, plus a bulldozer and front-loader. This link will take you to the specifications . The most important details for TMP are its weight (5.4kg with battery) and range: 1km when used in backpack mode. Judging by Harris’ other products, I would suspect that it could reach about 3km when vehicle-mounted. Simply placing it in a tall position would probably extend the range even further – perhaps to about 10 or 15km.